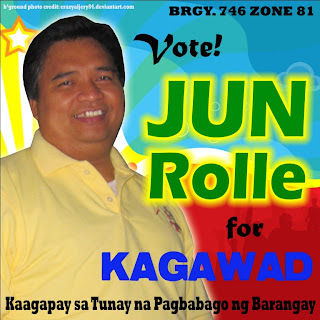 For the past couple of weeks, I have been acting like I don't care at all about Dad running for Barangay elections. He lost twice already so when I found out that he's running for Kagawad again, in my mind I was like, "Haven't you gotten tired of it yet?" So while they campaign - my sisters and my mom included - I stayed inside my room and found myself other more important things to do. I went on with my life. Everyday on my way to work I walk past thousands of posters and streamers of other candidates. Dad has some too, only fewer. I kept murmuring to myself that I need not do anything because after all, he won't make it. Because whether we like it or not, Philippine politics has never been about looking at what the candidate can do for his constituents. It's never been about vision and a genuine desire to serve. Popularity is the name of the game, and only the wealthy and famous wins. I realized that at the end of the day, the affection of a daughter prevails. Whatever happens, I'll be in deep content because I know that I did my part. Now the rest is up to the Mighty One up there. I pray that He bless Dad in his pursuit for public service.